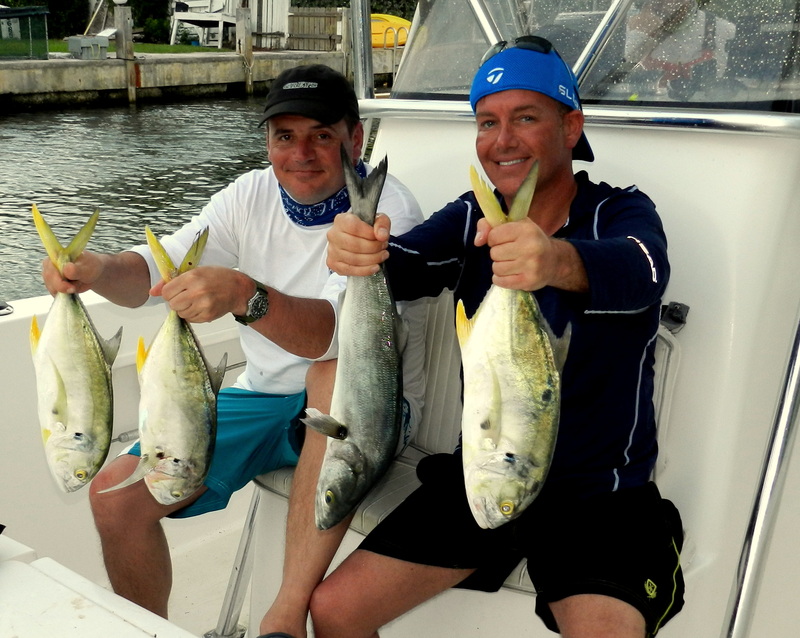 Like most guys on their Fishing Holiday in the Florida Keys the two Steve,s came with a must catch list. Now this is fine by me and Mike in fact we think its a very important part of our job here at Fish the Dream the only problem we have is the weather gods. First part of the week was tough to say the least but as the week went on the winds were dying and on top of the guys list was dorado offshore so on the last but one day we rigged and tried but the swells were to bad so we had to come back. So it was down to the last day which the wind was looking the best so my cunning plan was an old school trip offshore. 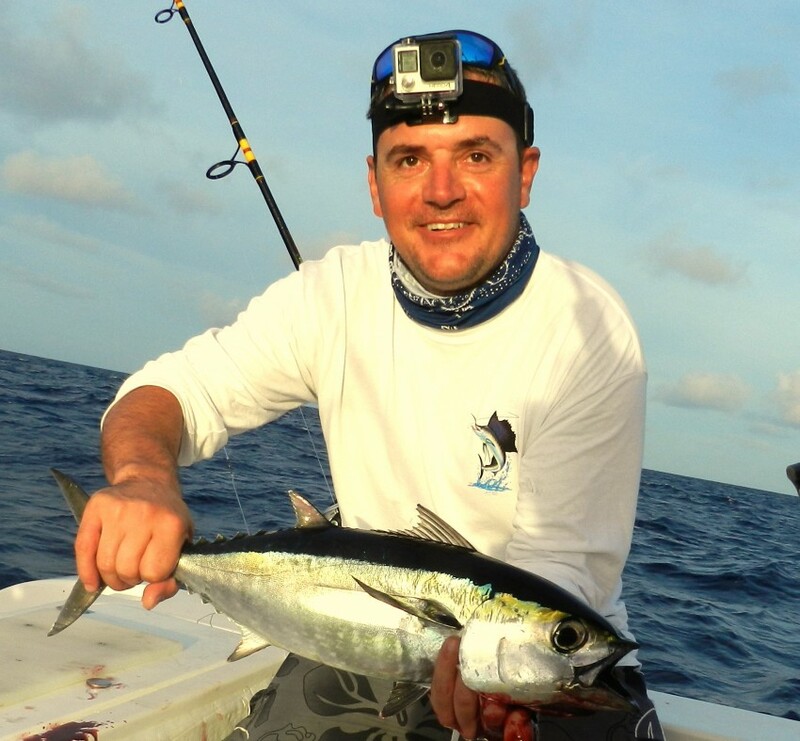 In recent years we have gone down the locals route of a normal start look for dorado heading to the tuna grounds fish the afternoon bite then look for dorado on the way home. Old school drag the guys out of bed at silly o’clock in the dark a 26 mile run in full dark to the tuna grounds fish tuna then you have all day to find dorado. So off we went all the crew sleeping like babies more to come on that later not flat smooth but a doable run to get to the grounds at first light, rods in and tuna on ! 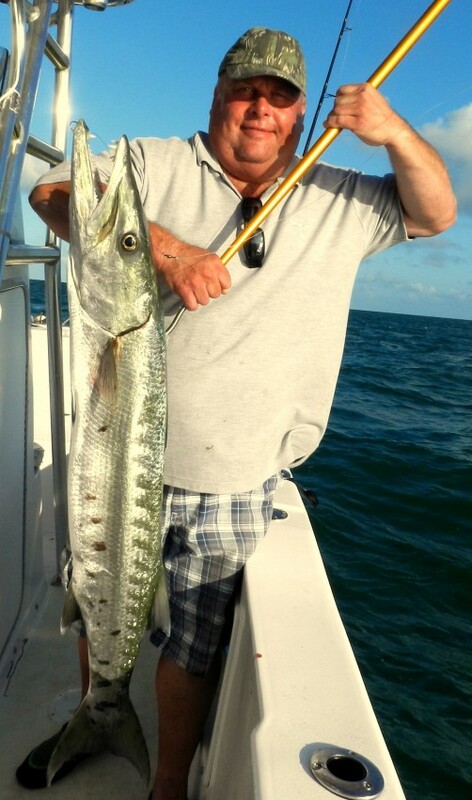 Not massive fish but to see a trolling rod bend over and the drag scream what offshore is all about the bite was so on fire we only used two rods and we were the only boat there. So with enough fish for us and a few for the shark next on the list was dorado so with eyes on the sky the search was on. Some days the Atlantic ocean is a very empty sea and this day was one of those then after many hours of looking a small and broken weed line in about 500 ft to broken to troll so out went some live baits. It’s hard to describe Irish Steve’s face but with a jumping yellow-green and blue dorado on lest just say happy does not even come close. Looks like my choice of Capt Mike as my right hand man is way better than I ever expected. Boating skills I never doubted and fishing skills lets just say he is a quick learning natural but what has surprised me is his people skills. So now I have a boat man, camera man and to his list he has added entertainments officer so when the guy,s asked a few questions about Key West Mike said ” if you want to go I can take you and show you around ” Well lets just say it was the reason the guys slept so well on the way out top marks yet again Capt Mike so even heart attacks have a good side. 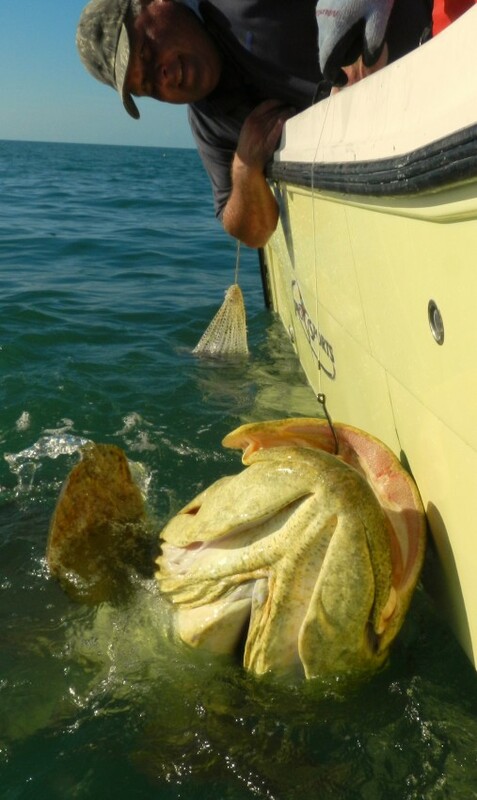 Not sure if it is what you think about when you book a Fishing Holiday in the Florida Keys but this week not only have we been fighting the winds but the other day we had nearly 2 in of rain. Sorry it’s not my fault and the Keys does have over 42 in per year nearly twice that of the UK does it affect the fishing not really its is just annoying have to take my guys to buy rain ware but as they say you have to do what you have to. The good news while the weather gods have been giving us a hard time the plan B’s and plan C’s have been giving us plenty of sport and the two Steve’s yes my two guys this week are both called Steve. 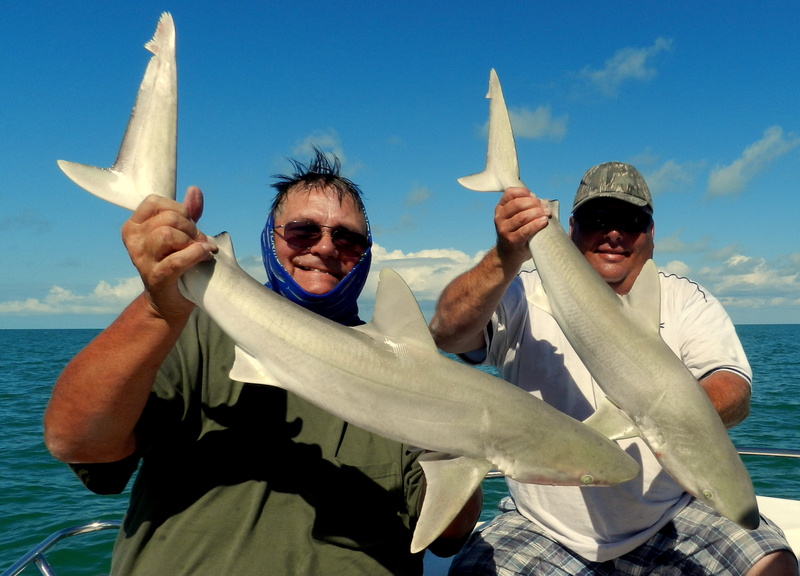 Jacks are so much fun and when you catch one each cast the smiles last a long time mix in a few small shark and you can have a perfect day. Winds not perfect yesterday but Capt Mike and I need to put some big fish on these guys but the tide was running with the wind so a wreck in the bay and an early start was the order of the day. 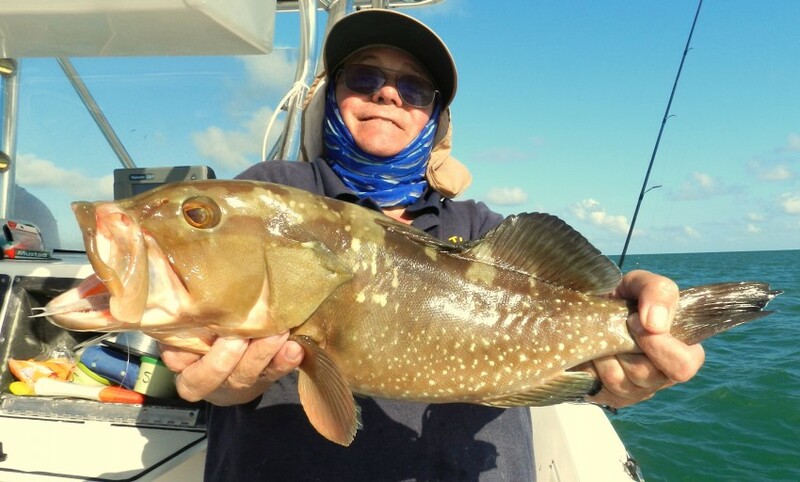 Yes it was plan A all the way yesterday a bit a pain to get the anchor right in strong winds and we had to use two but we got it right then big bait on that needed sight of a big balloon being taken down by a grouper at last big fish on !! After two mid 100 lb fish to the boat and some very surprised anglers newcomers to our style of grouper fishing just cant belive what we have to do shark gate crashed the party. 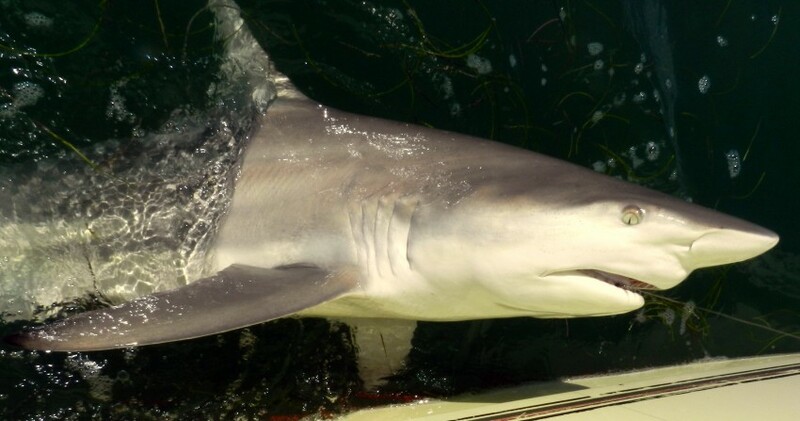 Shark on grouper rods dont work so the only choice you have is to drop back from the wreck and enjoy the fish or move in the wind a move was not on so a drop back and break out the shark rods. 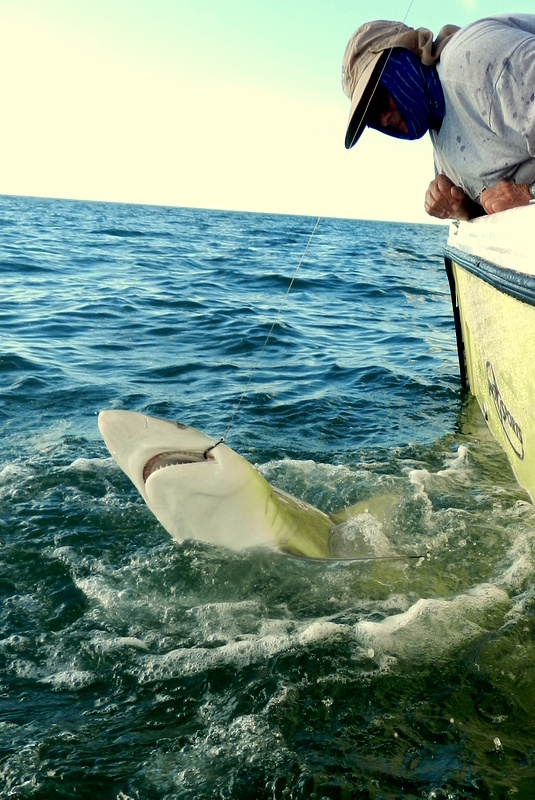 Irish Steve’s biggest fish before he came was just 16 lb cod so when he became attached to a near 400 lb bull shark a whole new game. I have to say he handled it like seasoned pro but this fish was so big we had to throw the anchor and follow poor Steve was just shaking his head what an introduction to big game fishing beating your PB by a factor of over 20 times. The other day the young and much better pair of eyes of Capt Mike made our something that was not right and we changed course to have a look. 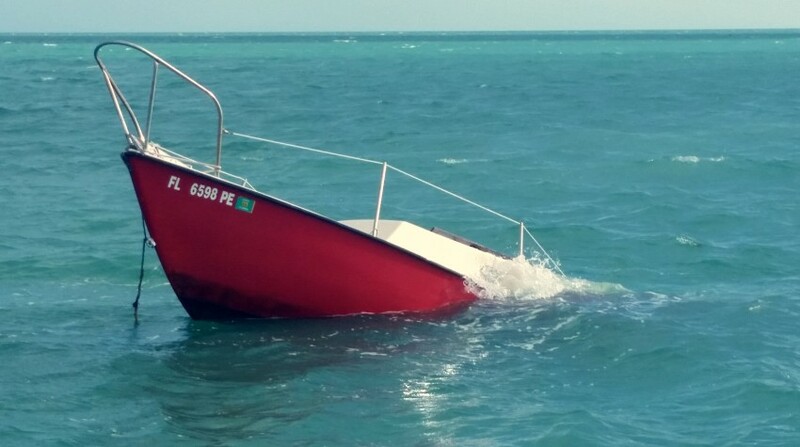 Not what any one ever want to see or find in a rough and windy sea a nearly sunk sail boat. No people in the sea and we stopped to call it in to Coastguard, love all the new tech stuff Capt Mike emailed then all the phots and they took down all the GPS details thanked us and told us to go on our way it could have been a lot worse. Comments Off on Tough start again ! 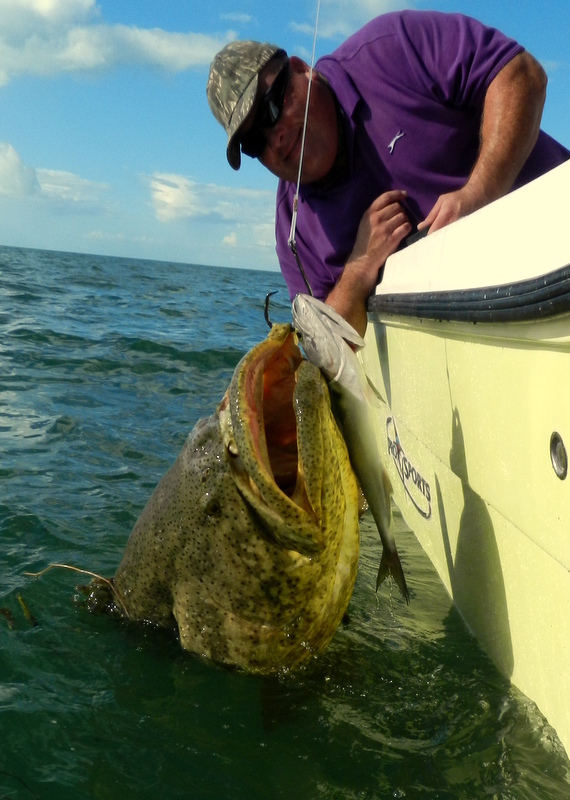 First some fantastic news after a long hard month looking we have found a new home and base for our Fishing Holidays in the Florida Keys. Good news it is only two blocks away bad news it has not been lived in for three years and is going to need a lot of work but is the only one we have found. It is water side and has enough room for people to stay but more and more people seem to want the upgrade to their own villa and a pool. So from now on all guest accommodation will be as you want just let us know in good time and we will sort it out for you. 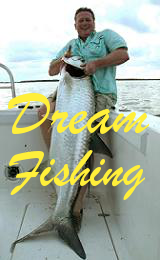 Back to last week well as I said a few blogs ago it was in at the deep end for Simon and Rob to tell people they will catch fish to near 500 lb in just 10 ft of water and the fight no battle will be nothing like they have ever done with a rod before. We had one day offshore in search of dorado but some days it is a big empty ocean and after many hours of trolling we ended up on the tuna grounds and then from nowhere a school of near 20 lb dorado. In seconds it was two on then just as quick two off the norm is to hold a fish in the water to keep the others at the boat but this did not go to plan and both fish were dropped sorry guys but that’s why they call it fishing not catching. Then to add insult to injury we were trashed by monster amberjack hard on the bottom in 500 ft lost three unstoppable fish not the best day we have ever had so the cunning plan was a last day in the bay on our wrecks. Well this went far more to plan the guys had been beat up with grouper so sharks were the plan and my toothy friends did us proud lots of hard fighting fish no monsters but in record temps and humidity fun all day action. 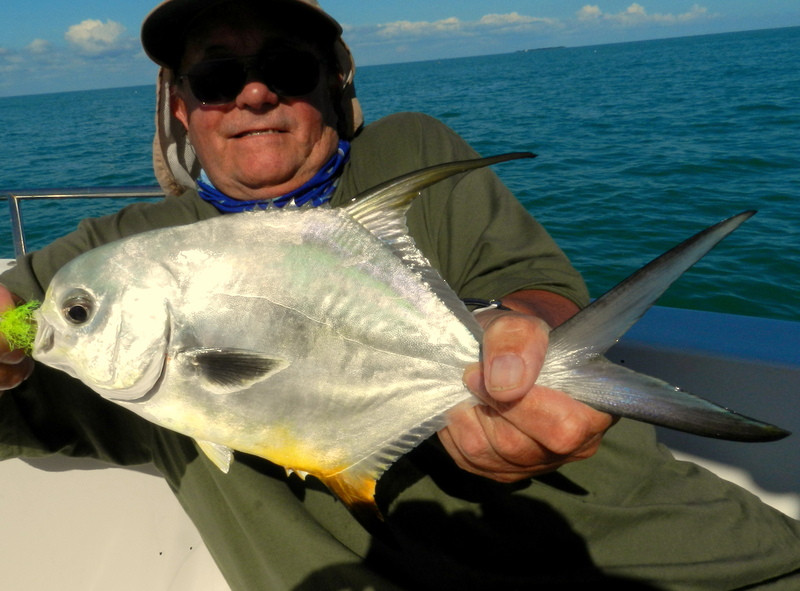 Even rounded of the week with a new species a palometa number 125 to the boat and number 39 for the week. Good week guys and great fishing come back anytime both Capt Mike and myself enjoyed fishing with you and hope you enjoyed the fishing. 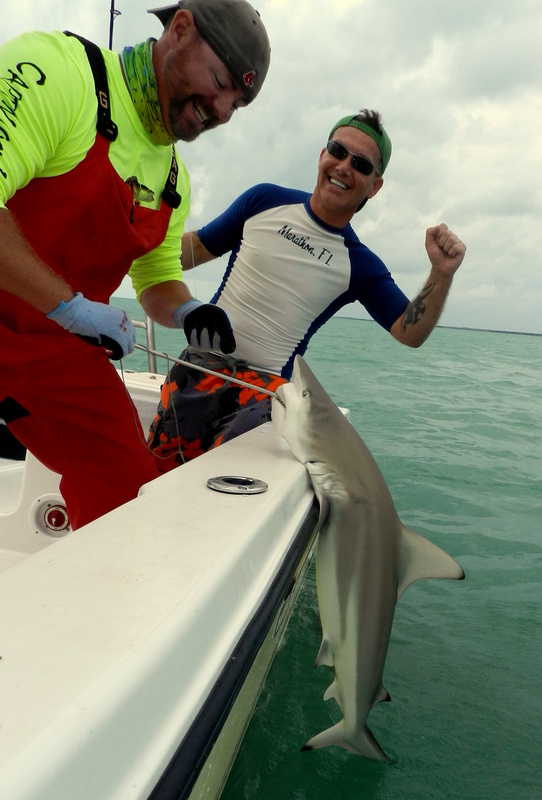 Yet again a massive thanks to our new Capt Mike Sovay this sometimes happens in The Florida Keys and ever time very special Rob and Simon will remember this for a very long time so I now have a fantastic new Captain and cameraman !!! Mr Mike !! 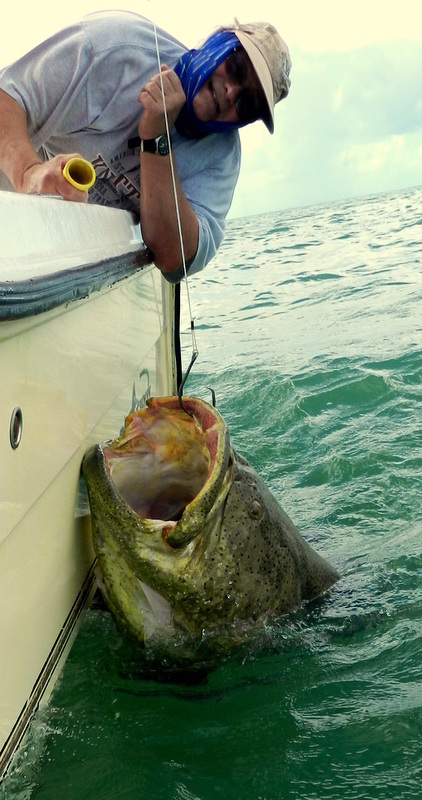 After doing these Fishing Holidays in the Florida Keys now for over 12 years I still get that special feeling when a plan comes together as it did yesterday. 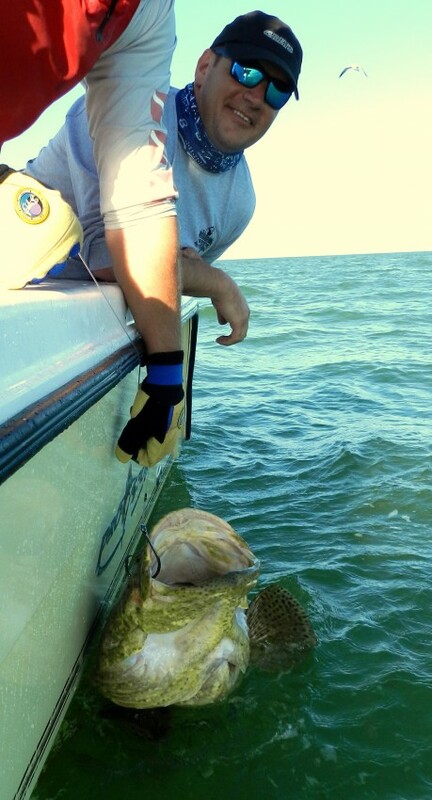 So weather gods said go wherever you want and have fun so deep into Florida Bay we went the ask was some shark then an other go at those mad grouper. 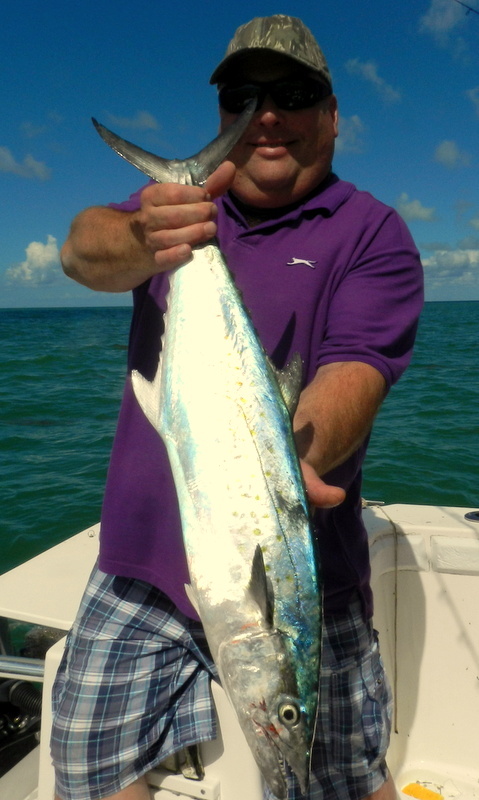 Getting to the main wreck tide not at its best but place alive with perfect size jacks so top up the bait boxes with as many jacks as you wanted always hard to leave feeding fish and all the guys were having way to much fun that is the joy of bait fishing in the Keys. 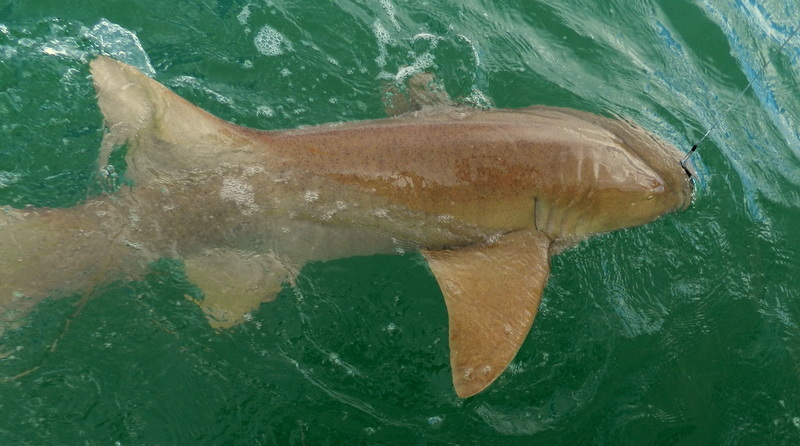 So off the main wreck by a few hundred yards you dont want grouper when you are shark fishing and in a very short time the shout was ” fish on ” we were in a mess of black tip all I would say just over 100 lbs as much fun as sharking gets. 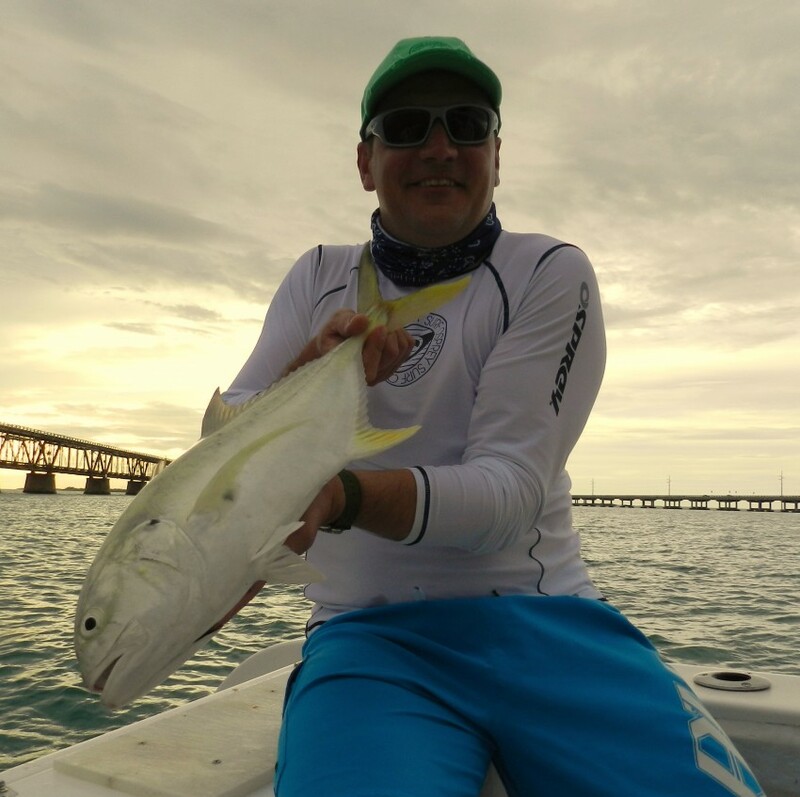 These fish just scream drag jump all over the place a bit of a pain at the boat but Capt Mike is learning very fast and doing a top job on the leaders he sure is a good find. 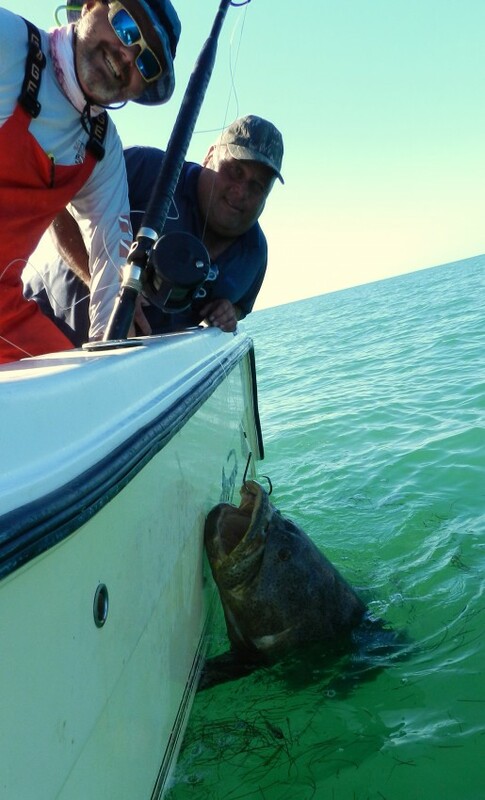 Not sure of numbers I think it was about 8 and one very big near 200 lb nurse shark but tide turned and the grouper started to call come play if you dare. Boy were they on the feed not even the perfect anchor sett but fish right under the boat baits being hit within minutes then as normal all hell braking loose and again Capt Mike doing a fantastic job and when he looks at me and says ” NO YOU DONT ” I get the message hate getting old. 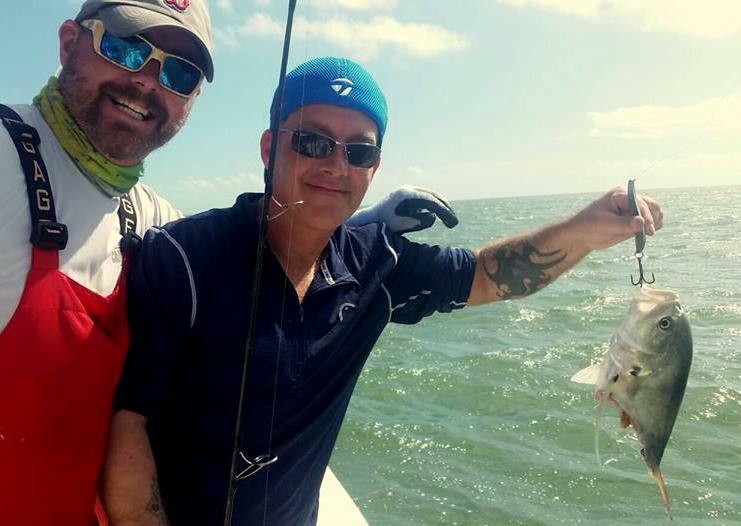 Best yesterday was way over 400 lbs Capt Mike now doing the 100 lb dead lift and on one not even the head was out of the water and when this fish first came to the boat both Simon and Bob just stared in total disbelief. 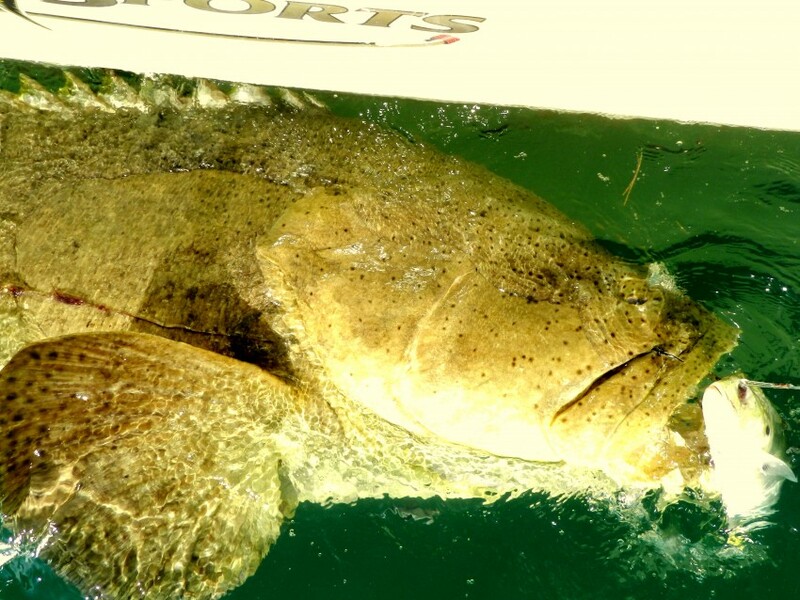 Only cloud yesterday was losing a monster shark it took the grouper bait which is on mono and just smoked the 40 lb drag and we had to give chase but lost out in the end but we will be back ! !